VICTORIA - B.C. 's new trans fat regulation will come into effect Sept. 30, 2009, restricting industrially produced trans fat at food service establishments throughout the province, announced Ida Chong, Minister of Healthy Living and Sport. VICTORIA - BC Ferries is pleased to announce it is one of the first to adopt the new provincial Public Health Act regulation which restricts trans fat in all food service establishments. PROVINCE RESTRICTS TRANS FAT IN B.C. VICTORIA - B.C. 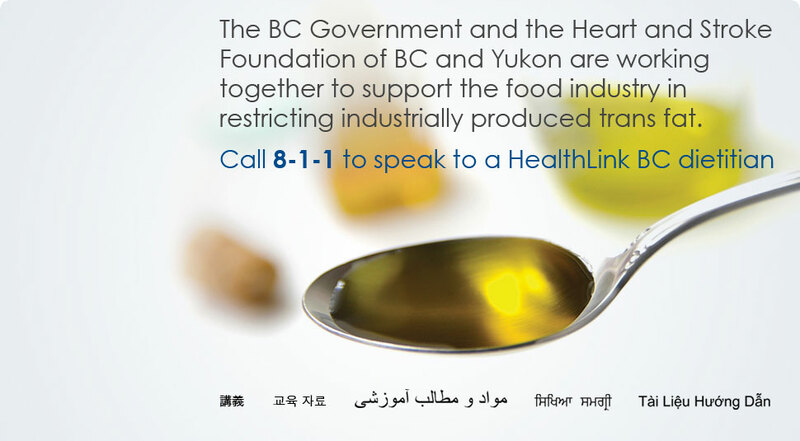 is the first province in Canada to restrict trans fat in all prepared and served foods in B.C. restaurants, Minister of Healthy Living and Sport Mary Polak announced.